the ceremony the best statues just walked out. After weeks of speculation, the Toronto Maple Leafs finally unveiled their new Legends Row on Saturday as part of their Fan Fest weekend. 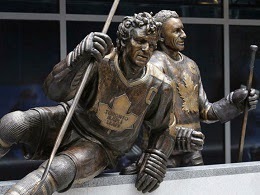 The new monument features bronze statues of Ted Kennedy, Johnny Bower and Darryl Sittler, with other legends from franchise history being added each year leading up to the team’s centennial celebration in 2017. The event was a big deal for Maple Leaf fans, so it goes without saying that DGB spies were in attendance. Here’s a selection of some of the things they managed to overhear. Yes, it certainly is a thrill to get a glimpse of a superstar from a long-bygone era who you can only remember through stories passed down to you from your grandparents, but maybe don’t say that out loud to Darryl Sittler, ok Mr. Dubas? Oh cool, they left plenty of space for another eight to ten good players, just like they did for the current roster. Quick, get these wonderful tributes to the franchise’s beloved past unveiled before Tim Leiweke shows up with a blow torch and starts melting everything down. This one statue of a guy taking a penalty shot is so lifelike that if you stare at it long enough it almost seems like it’s actually moving ever so slowly towards… oh, sorry Mr. Allison, didn’t realize you were here today. Oh great, the newspaper guys are already writing stories ripping the Kennedy statue for not talking to the media. Wow, you scored six goals and ten points against the Bruins in 1976, Mr. Sittler? I didn’t even know Andrew Raycroft played for them back then. The statue that pays tribute to the diehard fan who has spent his entire life cheering on the Maple Leafs is pretty cool too, although you have to go to a sports bar several blocks away to find it. I haven’t seen this much bronze at one hockey event since that time Teemu Selanne gave us a tour of his trophy case. Yes, this is a celebration and we want everyone to have a good time in their own way, but we’d still appreciate it if you’d tone it down with all the twerking, Mr. Bower. Every time you try to unveil a statue, you spend all your time chasing away filthy vermin that swoop in, scavenge all the food, and then crap all over everything they see. Oh, and once we get rid of the bloggers, we should probably also do something about these pigeons. There’s a cool statue over there of hundreds of guys in Maple Leaf jerseys standing completely still and not moving and… oh, wait, sorry, that’s just the Fan Fest autograph line. Really, Mr. Sittler, you once got so mad at the organization that you stripped yourself of the captaincy and then demanded a trade to the Flyers? Good thing we’d never treat our captains that way now! But just to make sure we don’t, please tell us the specific steps we’d need to take to make that happen. So the plan for this year is to have three Maple Leafs players on a bench permanently, never moving, just staring off into the distance forever. Well, four if you count James Reimer once the season starts. Apparently they’ve already started work on the Leafs legend statues to be unveiled in 2016, according to that guy over there with the chisel who keeps asking how to spell “Stamkos”. "Good thing we’d never treat out captains that way now!" 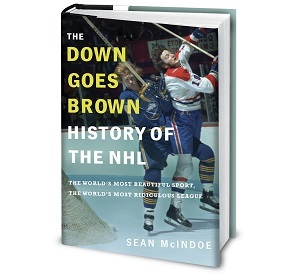 "I haven’t seen this much bronze at one hockey event since that time Teemu Selanne gave us a tour of his trophy case." The Raycroft line was fantastic, Sean. There was a silly picture of Andrew floating around years ago, with a beach ball going over his left shoulder, as looked confused and hopeless in net. Couldn't stop looking at that damned image, based on the Leafs' season that year/decade/since-1967. I don't get it. Why would the guy with the chisel need to ask how to spell Stamkos multiple times? It's not that hard to spell. Does he just have that bad a memory? You're talking about a league that once spelled "Boston" with no vowels and two Q's. Engraving isn't a strong point.